Linda: I’m telling you; the rich got it figured out. The effect is instantaneous. 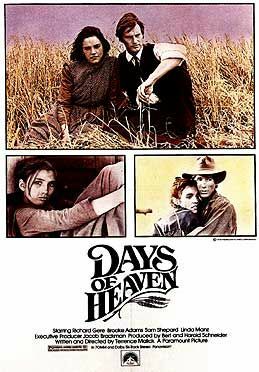 The moment DAYS OF HEAVEN begins, you are fully taken into what can only be described as the cinematic incarnation of heaven itself. Striking yet sumptuous still images of America and the suffering Americans of yore, fill the screen in a montage set to a classic Ennio Morricone score. It isn’t the content that constitutes heaven but rather the bold and commanding manner in which writer/director, Terrence Malick, presents it to his audience, that transcends the filmmaking abilities of any mere mortal. In that sense, Malick is the cinematic equivalent of God, and like God, Malick is omniscient. He is aware of all the tiny moments that make up the lives of his characters and how each of them can go on to change the world around them without even realizing what is happening. Sometimes, watching through Malick’s eyes feels like you might actually be watching from the clouds. The world we are privy to in DAYS OF HEAVEN is farm country, Texas, 1916 (actually shot in Whiskey Gap, Alberta). Bill and Abby (Richard Gere and Brooke Adams) are a couple, riding the rails with Bill’s little sister, Linda (Linda Manz). They take up work in the wheat fields just in time for harvest season, after Bill got into a fight and accidentally killed his foreman at his previous manual labour job in Chicago. Everyone they encounter knows them as brother and sister, a decision made to avoid talk amongst the other prying workers. Believing her to be unattached, Abby catches the eye of the farm owner, played by Sam Shepard and known only as The Farmer. He is unmarried and ill, with only a short time left to live and no one to share his time with. When the harvest is complete, he asks Abby to stay on with her “brother and sister” and marry him and she decides to do just that. The trouble for The Farmer is he doesn’t know that she and her lover are just waiting until he passes away so that they can inherit his fortune. The trouble for Bill and Abby is that they don’t know how long their love can survive the charade, nor when The Farmer will die. DAYS OF HEAVEN triumphs for a number of reasons, not the least of which is Malick’s incredibly focused direction. His screenplay is as lean as the times in the film. Dialogue is sparse and the plot is forwarded instead by the activity taking place on screen, allowing literally for the action to speak much louder than the words. All the while the harvest is happening, words are barely spoken, safe for some minor exchanges about being hungry or where someone is from. This leaves the viewer to piece together what is happening through looks and body language and fractions of larger conversations that reveal just enough to connect the dots. And who wants to listen to a lot of false dialogue anyway when you can allow your ears to take in the brilliantly designed soundscape, as mixed by Barry Thomas. Whether the wind is whipping through the wheat in the fields or locusts are descending in biblical proportions upon them, the sound is always impeccable and dynamic. It had better be too to keep up with Nestor Almendros’s Oscar-winning cinematography. Together, the viewer is drawn into the drawl one would expect when staring out into the fields on a hot day in the south and watching the buffalo roam. With every element coming together so brilliantly, it’s hard to believe this is only Malick’s second feature. 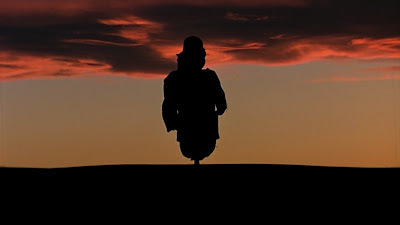 Another trait Malick shares with his maker is that he does not judge, at least not from behind the camera in DAYS OF HEAVEN. As the story unfolds in front of us, Malick is not concerned with taking sides or playing sympathy, he only seems interested in how best to present it to his audience. This great respect for the audience’s capacity to appreciate the depth of his artistry grows stronger as his scope goes wider. To pull away from the central story is to see the grander setting surrounding it. In it, Malick gives us the America of the time and the great divide between rich and poor. But even as Bill, Abby and Linda go from having nothing to having so much that they feel the need to throw food around as though it were nothing, Malick does not condemn them. That said, some fairly intense punishment does befall the whole lot of them eventually but even then, Malick is just there to observe, and beautifully so, as their fates are carried out. 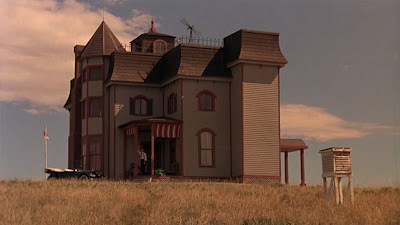 For better or for worse, this was just the America of the time and DAYS OF HEAVEN proves Malick is just one of the greatest American filmmakers of his time.